By Jared OwensTHE makers of Rabbit-Proof Fence have rejected claims by historian Keith Windschuttle that the film lies about a government policy to "breed out" Aboriginality in the 1930s. In the third volume of his The Fabrication of Aboriginal History, Windschuttle claims that two of the three girls the subject of the 2002 film were removed in 1931 for their own safety, because of alleged promiscuity with white station workers, not as part of a systematic breeding program. Director Phillip Noyce and screenwriter Christine Olsen provided a letter from Western Australia's chief protector of Aborigines Auber Octavius Neville, which said one of the girls, Daisy Kadibill, 8, was removed to stop her from mating with a full-blood Aboriginal man.The evidence of an Aboriginal "breeding policy":Olsen said Neville had a clear vision for Aborigines, which she claims he articulated in 1933, while lecturing to promote his own book Australia's Coloured Minority. The Daily News, reported on June 8, 1933, Neville saying: "The decision made by the commonwealth government to adopt as a definite policy the encouragement of marriages of white men and half-caste women with a view to raising the standard of mixed blood to that of the whites is nothing new in this state. I have foreseen it for years and sponsored it as the only natural outcome of the position. "The blacks will have to go white. It is exemplified (by) quarter-castes and by the gradual absorption of the native Australian black race by the white. 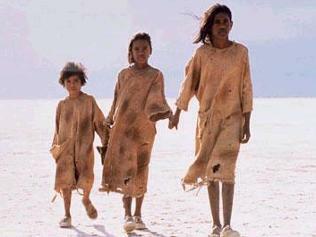 "Comment: For more on Rabbit-Proof Fence and other Aboriginal movies, see The Best Indian Movies. Below: "Bone of Contention: A row has broken out over the historical accuracy of the film Rabbit-Proof Fence."